With 10 minutes of prep yesterday night I made these lovely watermelon dosas for breakfast today. You can make a carefree breakfast with the batter ready the previous night. Perfect, filling breakfast for busy weekdays. Wondering how did these dosas come into being? Apparently, they have been around for decades in Konkani households. Since ages, people have made it a point to not waste any part of any produce. Like using ridge gourd, banana peels, using stem, roots of banana and colocasia plants, people thought of ways to use watermelon rind. The white part of watermelons attached to its peel that is usually thrown away. They decided to use them to make dosas. These dosas are so flavourful with a big hit of smell and taste from watermelons. They came up with a perfect but simple rice batter to make super soft, fluffy and delicious dosas. The dosas usually looked white in colour. I always add some edible red pieces of watermelon to the batter to give it that lovely colour. Give these dosas a try. I'm sure you'll love them as much as we do. Prepare the batter a minimum of 6-7 hours before making the dosas. 1. Soak rice in water for at least half an hour. After soaking, wash the rice well and drain all the water completely. 2. Puree the white rind portion or pieces of watermelon in a blender/mixer. You can use just the white rind portion of watermelon or just the red edible part of watermelon or use them together too. No matter what you use, the dosa tastes of watermelon in the end. However, the colour of the dosa depends on what you use. For a bright red colour use only watermelon pieces. For white coloured dosa use only the rind portion. If you use both rind and watermelon pieces then the colour of the dosa gets light pink/orangish. 3. After pureeing the watermelon, add in the soaked rice, grated coconut, washed and strained beaten rice to the melon puree and grind them together into a smooth batter, without using any water. The consistency of the batter should be medium thick. Do not add any water while grinding, as the water given out by watermelon is sufficient to make a batter. If needed add very little water, only as much as required to make a batter. 4. Transfer the ground batter into a vessel, add salt to the batter and mix well. 5. Allow the batter to ferment overnight for a minimum of 6-7 hours. The more the batter ferments, the better. Softer, fluffier dosas you make. If the weather's cold you'll need longer resting time for enough fermentation. 6. After fermentation, the batter rises. Give the batter a good mix and you're ready to make dosas. 7. Heat up a frying pan and set it to medium heat. 8. Pour a ladle full of batter in the centre of the pan and then spread it a little into a round shape. Cook closed until it cooks on one side. 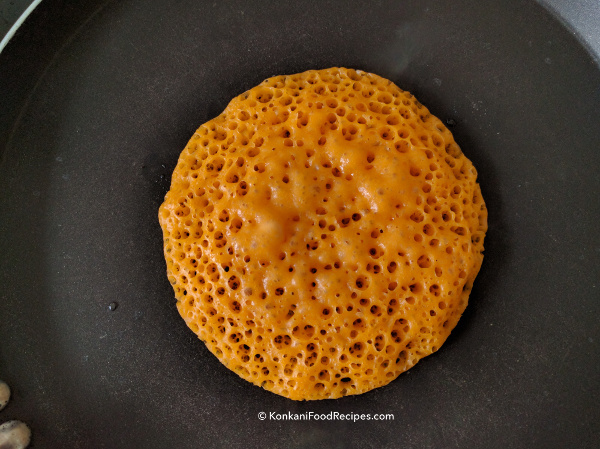 Beautiful craters are formed on the dosa. Add a tablespoon of oil uniformly all over the dosa. Flip it onto another side and cook until done. You can make the dosas thick or thin. I personally like them medium thick, not too thin, not too thick. Don't make them too thin. Do not spread the batter using the ladle to make thick dosas. They'll then be super fluffy & soft, provided your batter is well fermented. 9. Remove off the dosas. 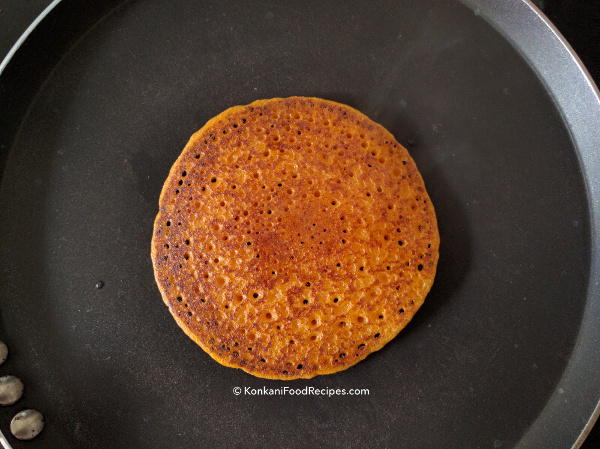 Just a light brown tinge on the dosas, once it's cooked through, will make it perfect. Serve hot dosas with lots of butter on top along with a spicy coconut chutney. 1. 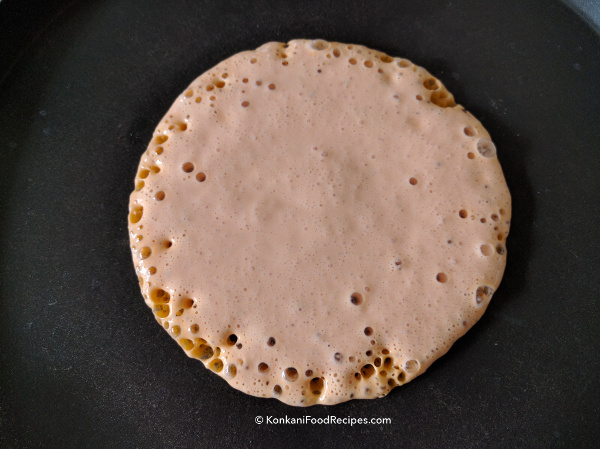 Add grated or powdered jaggery to the dosa batter while grinding or after grinding the batter and mix well. You can add jaggery before and even after fermentation, adding jaggery just before making dosas is also fine. 2. Add jaggery according to your palate, how sweet you would like them to be. 3. Jaggery dilutes the batter. So, if you already have a watery batter, I would not recommend adding jaggery to it. The dosas may then stick to your frying pan. 4. Make dosas as mentioned above. 5. Serve hot watermelon dosas with ghee or butter on top. You can also serve it with sugar on top. Or you can also serve sweet dosas with a spicy coconut chutney. 1. Make the dosas just before serving and enjoy them hot. They have a tendency to harden after a while. 2. Coconut and beaten rice together make soft dosas. 3. Watermelon dosas are usually made at home when there's an excess of watermelon that you need to empty or there are not-so-sweet watermelons that need to be emptied.